Ang Langyaw as featured in Cebu Daily News. CLICK TO ENLARGE. 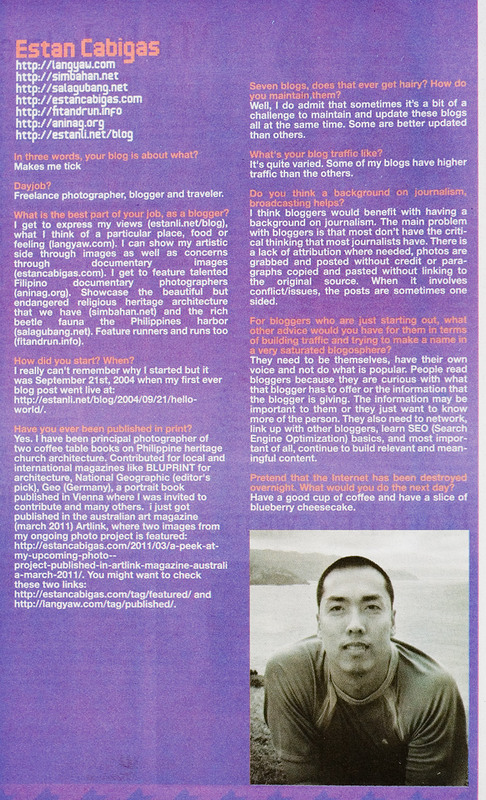 In the 17 March 2011 (today) issue of the Cebu Daily News, under BLISS, I was one of three bloggers featured including Daphne Osena. Click on the image at the left or read through the article as I have submitted it. In three words, your blog is about what? 1. What is the best part of your job, as a blogger? I get to express my views (estanli.net/blog), what I think of a particular place, food or feeling (langyaw.com). I can show my artistic side through images as well as concerns through documentary images (estancabigas.com). I get to feature talented Filipino documentary photographers (aninag.org). Showcase the beautiful but endangered religious heritage architecture that we have (simbahan.net) and the rich beetle fauna the Philippines harbor (salagubang.net). Feature runners and runs too (fitandrun.info). 2. How did you start? When? I really can’t remember why I started but it was September 21st, 2004 when my first ever blog post went live. 3. Have you ever been published in print? Yes. I have been principal photographer of two coffeetable books on Philippine heritage church architecture. Contributed for local and international magazines like BLUPRINT for architecture, National Geographic (editor’s pick), Geo (Germany), a portrait book published in Vienna where I was invited to contribute and many others. You might want to check these two links: estancabigas.com and langyaw.com. 4. Six blogs, does that ever get hairy? How do you maintain them? Well, I do admit that sometimes its a bit of a challenge to maintain and update these blogs all at the same time. Some are well updated as others. 5. What’s your blog traffic like? It’s quite varied. Some of my blogs have higher traffic than the others. 6. Do you think a background on journalism, broadcasting helps? I think bloggers would benefit on having a background on journalism. The main problem with bloggers is that most doesn’t have the critical thinking compared with journalists. There is a lack of attribution, where needed, photos are grabbed and posted without credit or paragraphs copied and pasted without linking to the original source. Where it involves conflict/issues, its sometimes one sided. 7. For bloggers who are just starting out, what other advice would you have for them in terms of building traffic and trying to make a name in a very saturated blogosphere? They need to be themselves, have their own voice and not do what is popular. People read bloggers because they are curious on what that blogger has to offer or the information that blogger is giving is important to them or just want to know more of the person. They also need to network, link up with other bloggers, learn SEO basics, and most important of all, continue to build relevant and meaningful content. 8. Pretend that the Internet has been destroyed overnight. What would you do the next day? Have a good cup of coffee and have a a slice of blueberry cheesecake. they should’ve featured you a long time ago! nauna pa dapat sa national. hehe. congrats! congrats bai. sayang, wala ta nagkita sa MOA last Saturdat.:-). It shed me some idea on this post.